A few days ago I wrote about the launch of a new “biomechanically perfect” running shoe, the Airia One that made claims re enhancing performance. I won’t relitigate the issues raised previously, as you can read them here. The post engendered quite a response on Twitter, Facebook and in the blogosphere. One little dig that I got was I did not mention the work of Finn Bojsen-Møller in relationship to the biomechanics and performance claims made by Airia. 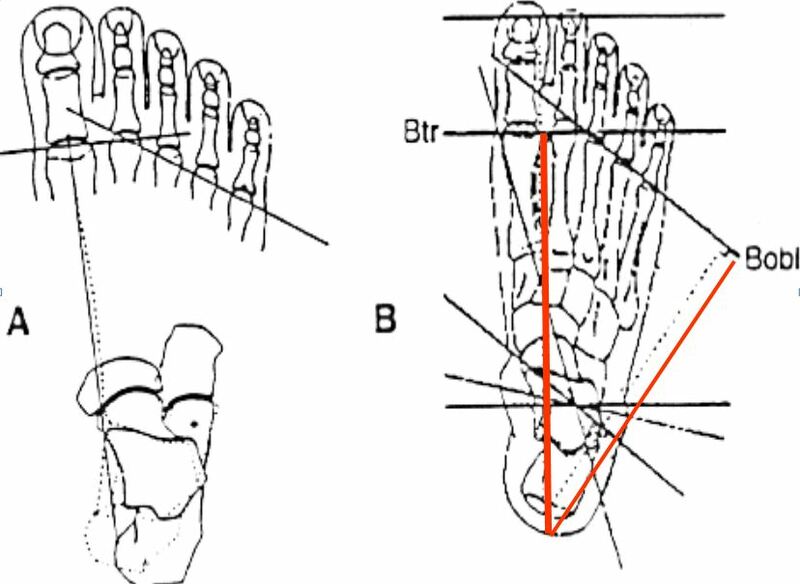 The dig came from someone who knows how much I like talking about and using his work as a framework to interpret foot biomechanics, so I thought this is a good opportunity to write about it. There were a number of reasons I did not cover it in the previous post is as it was already a long post; there was enough technical stuff in it that I had dumbed down to make it more understandable to a wider group of people; and it is sort of related to windlass function which I covered in the post. What he further proposed was that if you draw a line that is perpendicular to those axes from the axis to the insertion of the achilles tendon, those lines have a different length (see the red lines I added to the right of the image above). These lines represent the length of the lever arm that the achilles has to the metatarsal heads to raise the heel up off the ground. Think about this: if you wanted to raise up on your toes using the calf muscles, what is the easiest way to do it? Pivot about the transverse axis or pivot about the oblique axis? Given that the lever arm to the oblique axis is shorter, it is probably going to be easier if you pivot about the oblique axis or lateral metatarsal heads. 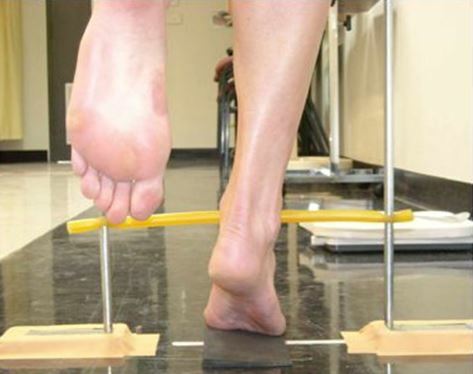 During gait we know that as the heel first starts to unweight, that the center of pressure tends to initially go laterally. This model would explain that the reason for that is that the body initially uses that oblique axis to unweight the heel as it is easier to do so because of the shorter lever arm. We also know that during gait, after that initial lateral path of the center of pressure, that it then tracks medial to go out through the medial forefoot. The model would explain this as the body shifts from using the oblique axis to using the transverse axis to pivot about as this lever arm is longer, therefore by using the longer lever arm, you can theoretically walk and run faster. What we found was that using the shorter lever arm to pivot about they could do a mean of 47 calf raises and using the longer lever arm they could do 39 calf raises which intuitively makes sense based on Bojsen-Møller’s model. The diagram below is taken from Bojsen-Møller’s original 1979 paper and gives a theoretical look at the two different modes of propulsion using either of the two axes. For our purposes here, ignore the rearfoot as this is not really related to a pronated or supinated position of the rearfoot. Clinicians will immediate recognize that two different callus patterns that go with those two modes of propulsion. The windlass mechanism gets established to support the foot (and Bojsen-Møller also claims the the calcaneocuboid joint locks). See the tightness in the arch on the left foot in the two diagrams above, so we have a more stable foot. This links into what I was saying in the previous post about the Airia shoe and how it might affect the windlass mechanism. 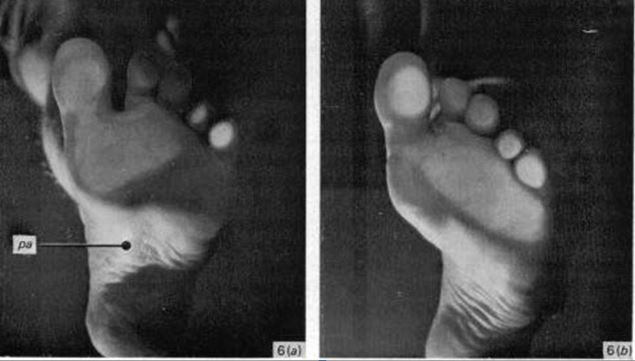 Later in the stance phase body weight needs to be transferred to the contralateral foot. It is going to be a lot harder to do that if you are still using the oblique axis as body weight is probably tracking in the other direction which is probably going to be inefficient and load the more proximal tissues in a detrimental way. Hopefully that makes sense. Clinically there are a number of things we do to transfer load from the oblique to transverse axes when it is indicated. Now back to the Airia shoe that has the design feature I discussed in more detail previously. 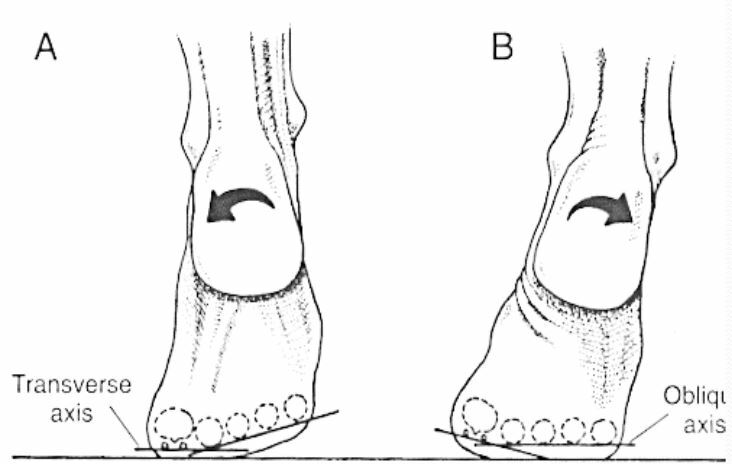 As it has a cant or slant that is higher under the lateral metatarsal heads, the design will help facilitate transfer from shorter oblique axis to the longer transverse axis and Bojsen-Møller’s model could potentially explain how performance gains could be achieved with the Airia One running shoe. This is simply based on the length of the lever arm to the achilles tendon and being able to run faster using that longer lever arm. However, if you are already functioning using the transverse or high gear axis, the shoe is probably not going to make any difference. In other words, the response to the shoe is going to be subject specific and one size does not fit all when it comes to running. The model proposed by Bojsen-Møller is just that, ‘a model’, a ‘theoretical construct’ but it does have explanatory usefulness that has clinical applications. I have certainly been teaching that for a long time now. Not everyone is in agreement and you can read some views on the problems with the model here. How many different running shoe brands are there? Since power = moment * angular velocity, the shorter moment arm potentially will produce less power for propulsion. However, as Eric Fuller has previously pointed out we cannot assume constant velocities when an individual propulses using one of Bojsen-Mollers axes over another. With the so called “high gear push off”, ground reaction force has a longer lever arm to resist ankle joint plantar flexion. Therefore much greater force would have to be generated in the Achilles tendon (and/ or other plantarflexors), with “high gear propulsion” to have the same angular velocity as “low gear propulsion”. We do not know Achilles tendon tension, nor angular velocity so we cannot conclude that high gear is automatically generating more power. It would appear that the increased stress within the Achilles required for high gear propulsion may increase the risk of Achilles injury. If the metarsophalangeal joints are energy absorbers in gait as Stefanyshyn suggests, then wouldn’t less power be lost via “low-gear propulsion”? i’m no physiologist, so i’m doing my best to follow along – but it’s an engaging discussion all the same! it’s interesting that as i’m on a journey to discover my best bet for a trail running shoe, i’ve settled (at least for now) on the new balance mt110 – the first iteration of which had what some called a ‘cambered sole’ which proved to be problematic for all variety of everyday runner, although the design seemed to come from elite-level ultrarunners like eric skaggs and anton krupicka. this design feature was eventually turfed in favour of a more level platform. i wonder if this will turn out to be another instance of theory not quite translating into practice …? wow, fun stuff. just what i like to think about when i go out for a run.